Summary and Definition: The Payne-Aldrich Tariff Act was essentially a compromise between the proposals of New York Representative Sereno E. Payne and Rhode Island Senator Nelson W. Aldrich. 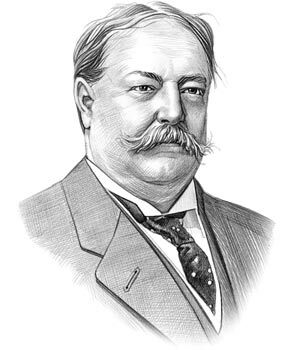 The Payne proposal, supported by President Taft and the Progressives, was designed to lower tariff rates. It met bitter opposition by Conservative Republicans who wanted to protect high tariffs which led to the Aldrich proposal. The compromise Payne-Aldrich Tariff Act had the effect of reducing tariff rates but also enacted a corporation tax. The Payne-Aldrich Tariff Act split the Republican party. President Taft alienated both the Progressive and conservative Republicans and gained a reputation for being weak and indecisive. William Taft was the 27th American President who served in office from March 4, 1909 to March 4, 1913. One of the important events during his presidency was the Payne-Aldrich Tariff Act. The previous president, Theodore Roosevelt, had steered way from the controversial subject of tariffs and no laws relating to tariffs were enacted during his presidency. The 1897 Dingley Tariff had been the last act passed and had increased duties (taxes) by an average of 52% and on some items by 57%. The 1897 Dingley Act was designed to protect businesses and industries from foreign competition. President William Taft believed that high tariffs hurt consumers, limited competition and protected trusts. Ignoring warnings from his friend Theodore Roosevelt he supported a new tariff act to lower rates. New York Representative Sereno E. Payne sponsored a lower tariff bill. In 1909 President Taft called a special session of Congress and the bill was passed by the House of Representatives. President Taft made a deal with the Speaker of the House, Joseph G. Cannon to push through the Payne proposal. Cannon was disliked by many of the Progressives who wanted to unseat Cannon. Taft agreed to place pressure on Progressive Republicans to stop the vendetta against Cannon who, in return, would push the Payne proposal through the House of Representatives. The Progressive Republicans were furious about the deal and furious with the President. The Conservative Republicans were totally opposed to the Payne tariff bill. When the bill went to the Senate, the conservative Republican Nelson Aldrich attempted to substitute the Aldrich proposal which called for fewer reductions and more increases in tariffs. The Aldrich proposal made nearly 900 changes to the Payne bill. President Taft was persuaded by Aldrich and other conservative Republicans to accept their proposals. The Payne-Aldrich Act was produced as a watered-down compromise consisting of elements from both the proposals. President Taft signed the Payne-Aldrich Bill even though he knew it would split up the Republican Party. Congress subsequently passed the bill officially on April 9, 1909. The Payne-Aldrich Tariff Act published a schedule consisting of a charge list of tariffs, prices, rates, etc., arranged or organized in a particular order. It lowered taxes by about 5%. Aldrich and the conservative Republicans conceded to including a corporation tax in the final version of the law. The corporation tax was a special excise tax of 1% above $5000 on all corporations and also introduced the examination of the accounts of corporations and trusts. The info about the Payne-Aldrich Tariff Act provides interesting facts and important information about this important event that occured during the presidency of the 27th President of the United States of America. The article on the Payne-Aldrich Act provides detailed facts and a summary of one of the important events during his presidential term in office. The following William Taft video will give you additional important facts and dates about the political events experienced by the 27th American President whose presidency spanned from March 4, 1909 to March 4, 1913.